Please please get Jamie and Claire back together again. They have to be together again if you are going to end this series. I hope your books are made into a television series. I am sooooo there. Claire marries someone else?!! I read all of the books and do not remember their marriage dissolving in A Breath of Snow and Ashes. I don’t think I could stand them not being together! Everytime they were separated by circumstance I would lose ALOT of sleep reading until they were reunited again! I just don’t see how if Claire’s love for her Jamie is so strong that she could remarry! Even if he were dead, I would like to think that Claire just could not bear to be with anyone else. The Outlander series are my absolute favorite books of all time and I hope they are made into a series as well. I just hope that whoever picks it up does a really REALLY good job! It’s not what you think [g]. But I think you must have missed a book. AN ECHO IN THE BONE follows A BREATH OF SNOW AND ASHES. Why all the talk of a “TV series” or “movie”? No need. No one alive will ever match Jamie’s sophistication, good looks and wit in our minds’ eyes… he’s bloody perfect residing in our imaginations; why ruin it? Forget the screen; embrace the “real” Jamie, made in Diana’s mind, nurtured, raised to perfection in ours…. I agree with you, Vickie. I think that it would be almost impossible to find actors who can embody the main characters. However…. does anyone else picture Jason Isaacs every time they read about Frank Randall, John Randall, and Alexander Randall?? oh my goodness, YES. Jason Issacs came to mind at once for Frank and Jack Randal. I agree VIckie. Diana gives us so much insight into the hearts and minds of Claire, Jamie and all the others. TV or movie can’t come close to bringing all of that out. Besides, I am sure each and every one of us has a mental image of each character (especially Jamie!) and I, for one, don’t want MY idea of Jamie’s appearance to be replaced by a movie/tv star, no matter who it may end up being. That is so amazing Michele! I’ve always pictured Jason Isaacs as the Randalls. The closest I’ve come to mentally casting a Jamie is Toby Stephens. Still, any director/producer who takes on this project is going to have to be incredible to satisfy the fans. I agree with you, Vicki. I hope that a series or movie will ever never be made of these books. I don’t think there are actors out there who can be EVERYONE’s idea of Jamie, Claire, Young Ian, Roger, Brianna etc.. These are the best books I have ever read. I always feel a little sad when I finish another one of these books because I can’t read it again for the first time. I always thought the guy from Thor (Chris Hemsworth) would make a good Jamie. I am looking forward to the SHO series coming up next month! I have read every book, bought and listened to every audio book, and now I can’t wait to see how the upcoming series interprets the work of this wonderful author. I hope Diana had creative control.. I think you’ll enjoy the show a lot, Bruce! I didn’t have “control,” but the production team were amazingly good about including me, showing me scripts and footage, asking my opinions (though under no legal compulsion to take them [g]), etc. I think they’ve done a fabulous job. Claire did marry someone else. Lucky you! You have another book to read before the next one comes out. I have been left somewhat content after each of the 1st six books, then I read “Echo in the Bone”. What the hell? There are so many “cliffhangers” and the next book keeps getting farther away. I can’t wait! I totally agree with you… finished Echo In the Bone and can hardly wait for the next book. At first I heard early 2013 and now it’s late 2013 ? Soooo love this series! I totally agree with you PJ, I rfinished Echo In the Bone and can hardly wait for the next book. At first I heard early 2013 and now it’s late 2013 ? Soooo love this series! I totally agree with you PJ, I finished Echo In the Bone and can hardly wait for the next book. At first I heard early 2013 and now it’s late 2013 ? Soooo love this series! PJ, I have just discovered the outlander series and listen to them all on audio. What a wonderful experience! I could not wait to get to the next book and now after just finishing echo in the bone, I feel like a part of me is missing its upsetting I want to continue reading(listnening) to the books but then again I dont want the story to end. signed anxiously waiting for written in my own hearts blood. I hope Ian and Rachel end up together. I’m so pleased William has found out. Where is Roger? Jem? I want Briana to and her family to go back and get re-aquainted with William. And why do they need to go thru the rocks to get the gold. Im sure its in North carolina 200 years later. If there is another book after MOHB, I might not live long enough to read it, so please no cliffhangers. What fantastic news for Cheryl! There’s another book for her to read while waiting for MOBY to come out! In one way I feel lucky to have come late to the series because I could devour the books one after the other without waiting (except for An Echo in the Bone…brief wait). Waiting for this next one…oi…It will be fun to rush out & get it. Hahaha I did the same thing! My mother has been talking about these books for years and I would always look at them and run away because they were so long! Not realizing that there was still another one, I bought all of them and read them in a few months! I think I read the second book in 2 days…I can’t wait for the last one…please hurry!! Not related to the answer you gave, but just wanted to say how much I have enjoyed this series. It has grabbed my attention like no other. It sent me in search of my Scotthish Graham family connections. Imagine how silly but exciting for me to find the Frasers in my family line. I have now gotten one of my daughters reading Outlander and she is hooked. We are both awaiting the 8th novel. I read the series the first time just drinking it in, the second time because I loved it so much and this 3rd time to really delve into each character and try to space the time until the 8th comes out. Thanks for such a wonderful tale. I must admit that the men, primarily Jamie, but Roger and Ian and Lord John and Willie also are wonderfully written. You have a knack in writing male members of your cast. I love the women also, but the men….yikes, good job, keep it up. Diana, you and Ken Follett are my favorite authors. You do so much research for your books and I feel this is the only way to learn history. You have an amazing depth that renders your characters so real..aye, they are all real to me! I love how you let them tell you what happens next. You are truly gifted. Thank God you had to try writing a book by writing Outlander. I have read and/or heard them all several times, and of course, can’t wait for Written in my own hearts blood. Divina Porter is a fabulous reader and I think does your novels justice. Please have her do the rest of them! I am travelling to Scotland to discover places in your books. Is Lallybroch a real place? We will hire a local guide, David Laidlaw, to show us the wonderful towns and castles in your novels. If you know of anyone else who may guide us, please let me know. We are so glad you became an author, no matter your other many accomplishments! Hugh Allison is a wonderful guide. If you look under the “Resources” tab at the top of the Home page here, you’ll find several “Outlander”-related tours and their operators listed; Hugh’s contact information is there, if you’d like to get in touch with him. Thanks sooo much for getting back. I will contact Hugh as well. Is there a chance (ever??) that you could come to Bend, OR for a signing? We have a great library and avid reading community with loads of book clubs. Please let me know if that could ever be on your radar and I will contact the library and book clubs! I imagine you escape to another “place” in the universe to create your stories. I have turned my whole family and many friends onto your novels. Here’s hoping the TV series happens!! You didn’t get An Echo In the Bone…its a for sure cliff hanger… read it slowly. You need to read Echo in the Bone. I need to reread An Echo In The Bone, I don’t remember the dissolving of their marriage! Gerard Butler as Jamie….oh yes!!!!!!!! Glad to know that book eight will be coming out this year. Felt very frustrated at the end of book 7.!!!!!!!!! Diana thank you for writting these wonderful books. I have the whole series and reread the whole thing every time you publish new volumn. I am looking forward to the whole adventure again. I have reread these books from beginning to end each time a new one comes out. I’ve purchased new paperbacks because the old ones wore out and now I’ve purchased the series on Kindle. Just finished the series again and cannot wait for the next one. These books are like a GOOD addiction. Thank you Diana for your imagination and writing skill! They are a good addiction!! I also have had to replace certain ones as they have become worn. I enjoy having all of Diana’s works “in the flesh” so to speak on my bookshelf but find myself reading them off of my smart phone . Easier to hold up in bed at night and comes with its own light! Google Play books store has all BEB’s and others. senior citizen new to internet browsing but am reading Outlander series for 3rd time while waiting for 8th book.wonderful reading thank you so very much Diana for the most exciting books i have ever read I agree with all comments made please do not ever stop writing. I have read and listened to all the books multiple times. I love them!! However, I hated Echo in the Bone! I found it so boring and incredibly disappointing. I agree, Claire would never have remarried. What a horrible storyline. I’m not sure I want to continue on. Cheryl: You REALLY need to read “An Echo in the Bone”! I know for sure that when I have finished the series I will re-read the whole Outlander series again – it is just so rich! Also most other books you have written, so keep writing Diana!! I have just finished reading today An Echo in The Bone, thinking it was the last book in the series. Now I can’t wait for the next one – but guess I have to! PS: Found your series when we went to visit where the battle of Culloden was fought, when tracing a very distant relative from our family tree, Scottish side. First time I read Outlander, I literally stayed up all night! Just could NOT put it down! It’s been that way with all of them so far. I love character-driven novels, and these are by far the best I’ve read in 40 years. (I’ve been a book junkie since elementary school.) I an champing at the bit for Written in My Own Heart’s Blood. Too many cliff-hangers to be addressed from the last novel. Also – enjoyed the Lord John books, but they remain a side dish compared to the Outlander series as a main course. I fell in love with Jamie and Claire, I would love for this to be a television series! Preferrably on a channel like sci fi. I agree Sci-fi would be a great channel for it. Choose the actors carefully because Claire ages beautifully in your books and so does Jamie. I read the first novel when I was in the ninth grade my mother thought I’d like it cause I was into paranormal stuff at first it want really my style but twelve years later I’m still reading it and re reading them the first one was the best but I still re read the while series every time you come out ith a new one our sonn sometim just for the sake of reading it again. My husband thinks I’m nuts but when it comes out on tv or in a movie I’m sure he’ll love it as much as I do I can’t wait top tell my mother about the tv series she’s gonna be thrilled! I can hardly wait I have seen a couple videos on you tube on casting ideas and the funniest one is that randall is played by the guy that plays the lesser of the dragoons in the patriot and thats how I always pictured him. There was alot of videos with Jamie as Gerard Butler but Jamie had to have red hairsome people don’t part attention I’m sorry. I babble I’m just really excited that I stumbled across this site I never knew it was here before. Thanks for the great books! I’m currently reading them fourth time right now (just finished Drums of Autumn) and anxiously waiting for MOBY! Outlander is my absolute favourite, but I love them all. About the movie / tv-series; Chris Hemsworth would make a great Jamie! I just saw “The Avengers” and my first thought was “Jamie Fraser!”, when I saw Chris in the role of Thor. I have to admit that I can picture several actresses in the part of Claire, but Jamie has always alluded me. The only actor I ever seem to be able to place in his part is Liam Neesom and he is to old to play a young Jamie any longer, maybe his Uncle, but alas not Jamie. I have a hard time putting a face on him, but it is not any of the mentioned actors…oh he may just always remain a mental image for me and that is ok too. how about vin diesel with red hair? His body and the way he stands is what i think Jamie could look like! I don’t normally blog for anything but please NO – not Vin Diesel… just no. Jamie is capable of many emotions and they need to be portrayed – subtly, but portrayed! Oh no, sorry not Vin. You know alot of people have said on here they want to keep Jamie for ourselves in our minds as we see him, and for the most part I agree. Now taking all into consideration I love Chris Hemsworth and he definitely has the body image down just need to color his and viola we would, might hopefully have our Jamie. Do what I am doing to refresh yourself and start reading them all again in sequence ready for Written in my Own Hearts Blood, just can’t put them down, at times I realise I am holding my breath. I just found out about the series on starz but cannot find a date! The Outlander series has me sitting on edge waiting for the next book june cannot get here fast enough! My sister and I are devoted fans! Thankyou Diana for giving us this wonderful escape from the daily grind and for bringing my sister and I closer than before! We are planning tv time together to watch the series! I bought all 7 books and I loved everything. This is the most beautiful story I have read and I read many books in my life. Oh–and you can get “The Custom of the Army” (a Lord John novella) as a stand-alone e-book for $1.99 [g], if you’d like to try him out. Diana. I keep re-reading all your Outlander Books, and everytime, I find something new or revealed. These are a great series of books which I have recommended to many of my friends. Are you not afraid that there is so much detail in your books that a min-series can’t cover it? I agree about the mini series, don’t think it will do her fabulous books justice. I am still holding out hope for a big screen movie series. Hugh Jackman as Lord John? Hugh Jackman can’t be Lord John unless he bleaches his hair (Lord John is blonde). How about Brad Pitt? HJ would be a good one to star as Roger. He can sing and he is tall, dark and handsome! But I am hard pressed to think of who could star as Jamie and Claire. Ideas? Outlander ???? The series isn’t called that in Australia. None of thee books are called that so I think we call it the Crossstitch series?? Why the difference?? The first book was called Outlander in the US and Cross Stitch in Australia (and, I think, the UK) due a publishing/marketing decision. I don’t think the series was ever marketed in Australia as a series and I’ve have never heard anyone here call it the Cross Stitch series either. Oh Lord. What happen to the new one coming at the beginning of 2013? Now it’s fall? I’m going to be dead before I can finish these books and probably wait another three years if this is not the final one. I hope I’m alive – or at least that you can read books in the hereafter. I fell in love with Gabaldon’s writing way back in 1993, so yes, I too hope (that if I perish) the hereafter includes the ability to access the continuation of Claire and Jamie’s story. And I too have been through all of the books countless times. I not only have a complete set of the hardcovers, but also the paperbacks and audiobooks. In fact, I think the audio is my favorite; I can listen at home while I knit and take the disc along in the car if I have to run errands. Davina Porter, who doesn’t merely ‘read’ the books, is amazing. Check your library and give them a try! Although I have a couple of other favorite authors, all too often I’m disappointed that a “popular” author just isn’t as good as Diana Gabaldon. I discovered the Outlander series in the early 90′s, after I had gotten Voyager first by mistake. Luckily, I saw that it was the third in the series, and searched to find Outlander, devoured that and then begged my hubby to find Dragonfly for me as soon as I finshed it. (I was huge pregnant with our second daughter-who’s now almost 19 and going off to Univ. of WA). Diana’s writing is magical. She brings you into the stories with ther character development and vivid descriptive language. I especially love her descriptions of what it feels like to hold, squeeze, nurse, smell and kiss a baby, *sigh*…I have read the books and listened to Davina Porter’s amazing narration countless times. As embarrassing as it is to admit, I feel like Jamie and Claire are like personal friends. Their relationship makes me appreciate my own marriage even more. I have all of the books in hardback and audio CD, and now have them all on my ipod. The audio versions are my fav too. I start them all over again when I finish the last one. I listen to them when I am cooking, cleaning, going to sleep at night, in the car, etc. (Yes, I’m obsessed) I have to draw the line at work-drats! I can’t wait until the 8th comes out. My kids roll their eyes whenever I recommend the series to others, but I am envious that they get to read them for the first time! Thank you , Diana, for the the gift of countless hours of pleasure and escape your books have given me. I know just how you feel. I am not getting any younger and am terrified that I won’t be around when the next couple of books come out. I haven’t heard anyone tell me that there is the definite ability to read in the afterlife. Diana, some of your readers are getting older. Please spare us!!!! Just finished scottish prisoner + downloaded custom of the army. Thanks for the tip, Diana. Her books r an addiction! Finish one + it leaves u craving for more. I drive my family insane while going thru withdrawls! Diana- I am praying that Showtime or HBO will proiduce this series of books.There is no other way to do justice to the series. I look forward to each & every book you write…..I am still looking for some of the shorter stories about Lord John. I even have the illustrated book of the 1st meeting between Jamie & Claire. I re-read these books every year starting in the Fall- then I reread LOTR- then I make do with other author’s books until you write something else great.Not that I don’t have a life:), but I really love to read. I just finished reading The Scottish Prisoner (again) and did it in one day. Once again these books are responsible for me failing to fulfill any other of my responsibilities – no time with family, no cleaning, no shopping, no work for the business – just a wonderful day of rest and transportation to another time and another place. Thanks for the break! The synopsis is great. Especially Mandy with her miniature cricket bat. I can just picture it. Can’t wait until the fall of 2013. I am only on book 4 and I accidentally read the synopsis of bk 8. My poor heart is aching, I love the characters so much. Diana Gabaldon, you are driving my friend and I crazy with this story, but we are slaves to your writing. We love all of the twist and turns and “oh my god, I can’t believe that just happened in this book”, while we read. I am excited to read bk 8, but can you speed it up, I don’t think I can wait until Fall 2013! I am now just so excited that YOU actually read my blog and responded! So, I guess I will wait until Fall 2013 (since I don’t have much of choice). I will try to read slower, but your books make that impossible sometimes. Hope you have many productive happy witing days, and I will have to check your book tours in the future to see if I can meet you one day. I think it may be impossible to read these books slowly the first time. I would thoroughly recommend re-reading from the beginning and savouring them the second time round. That should fill in some time between now and Fall 2013!! I re-read the entire series atleast once a year, i think i may have read cross stitch atleast 30 times or more. Love your work Diana, thank you so much. Thanks, Jodie Lee. It’s good to see from time to time that others suffer from the same affliction: can’t-turn-the-pages-fast-enough-the-first-time-I-read-these-books syndrome. I’ve now read Outlander about 7 or 8 times, a couple less for Amber, 7 or 8 for Voyager, and the other 4 at least 3 times each. I had feared “early 2013″ was going to become fall of 2013, since that’s when the big push is on for Christmas sales. Now that I know it, I will go slower this time; Drums is next. Happy reading! elf to read other works by other authors. I truly think if I don’t, I will just read this series over and over forever. And whatever will I do if there is no book nine? Oh my, Diana, what have you done to us???? You’ve nailed it.The first time through, Diana’s books are pure stay-up- until-three, I’ve gotta see what happens next page turners. It is only on the second (and subsequent) readings that you begin to realize her artistry. Little thing jump out, like the little girl, when allowed out of steerage, who “hopped about like demented chickadee”-so vivid, so seeable. When u finish the series, start over. I have read the whole series at least three tImes and they r detailed and complex enough to enjoy over and over. Go Diana. Excellent casting choice for Jamie, but who for Claire? Tall, with a force of will to equal Jamie’s, and the credibility to be seen as a physician as well……hmmmmm, maybe someone like Marcia Cross???? But not. And, who will be them as they age. I can also see Hemsworth as William in book 7…. I love the character development in these books. I’m a 64 year old surgeon and have followed breathlessly with the rest of you as this saga unfolds. Even my 85 year old aunt is in love with Jamie. Possibly the best books I’ve ever read. Lost count of the people I’ve turned on to this series. I can’t see how TV can do justice to this, however. It would take years to tell this tale on the screen….and that would only cover the first three books. What would any of us cut out for TV????? I totally agree with you. How can TV possibly do anything but massacre the amazing story Diana has gifted us with? Even the Harry Potter series was not done justice by it’s 7 movies. How could the Outlander series with its depth of character, breadth of story and myriad details not be shredded to pieces, similar to the abridged version of the audio books? I so agree with Chris playing Jamie (bonus that he is Australian) and Emma Stone for Brianna, can’t wait for the next book! I agree…Emma Stone would make the perfect Brianna!! I’m afraid that some of us who are truly ADDICTED to this series don’t take that long to read the books. I’m currently doing a re-read of the whole series (can’t remember how many times I’ve read them all), and I’ve now read Outlander through Firey Cross in the last 5 weeks. I should be through book 7 by the end of September. I had HOPED that book 8 (MOBY) would be out by Christmas, but I guess that’s not going to happen given what I’ve read here. SIGH! It’s just so hard to wait for more . . .
i CAN’T read them slower. when drums of autumn came out i literaly took to my bed and read it in 16 hours. i’ve taken to listening to them on audio just to slow myself down, lol. Read them all again. I’m pathetic but they’re basically the only books I read!! Those & the only other decent authors works…Anita Diamant. Over & over & over! Sad aren’t I ? It takes me less than 2 months to read the entire series. I am struggling to wait until 2013 to read it again. However, if you haven’t read The Wilderness Series by Sara Donati, you should. The Outlander is my favorite, but The Wilderness is a very close second. The writing is similar and actually there is a reference of Clair in the first book, “Into the Wilderness”. I absolutely loved the Into The wilderness series!! After reading all these comments I will have to start re-reading Outlander series again!! Love Claire and Jamie!! Thank you for the recommendation of the new series. I have just downloaded 3 of her books. I hope I like them:) It is so hard to read short, shallow books after reading Diana’s. I did notice that Diana wrote a nice comment in her book review. Excited for Moby! This synopsis gave me chills! Keep up the good work, Diana! Just thought I’d drop in and check the status of the 8th book! Glad I did! So looking forward! Love the synopsis! The purple critter has only six tentacles. Hmmm. I was hoping for a spring release date so you could tour all over during nice weather. Really want to meet you in person! I’ve just re-read the entire series for the third time in eager anticipation for the release of the next book. I keep telling all my friends to read this series as it’s the best I’ve read…and I typically don’t enjoy historical fiction…but let’s be honest – it’s all about Jamie!! Thanks so much for your timeless efforts to engage us, your readers. I’ll be counting the days until I can read it! Wishing you many happy writing days! I am on my 5th reading of the series and hope that I live long enough to read MOBY! Do I love the story??? Whaddya think! I first read one of your books 15 years ago. I think it was Drums of Autumn. I loved that book so much I ran right out and bought Out lander. I passed those books around at work and everyone who read them wrote their names in the back of the front cover, we filled the whole page. I have read all your books and loved each and everyone. Then I read a book by a different writer which I also liked in which Clair appeared or was at least alluded to. I couldn’t believe my eyes at first but I soon figured it out. Now I can not remember the authors name. Please if you know what I’m talking about ,remind me of that writer so I can read it again . It would help pass the time until Fall 2013. You are probably referring to Sara Donati – she wrote a similar series in which she mentions Claire. I enjoyed her series but cant wait for MOBY! Thanks for the LOL! The purple octopus caught me off guard. I loved the last snippet on FB with Brianna and Mandy. Mother Bear syndrome strikes again! You are so generous with your works in progress, I can’t but envy those who have only recently started the series. On the other hand, those of us that have been reading from the beginning…well, near the beginning.. ( I started out with Dragon Fly and discovered then that there was a previous book!) , watched the characters grow, reach maturity and some of them , die. It has been a wonderous journey filled with laughter and tears. It has been a great 20 years and I, along with so many others look forward to the continuation of the adventure. OMGOMGOMGOMGOMG that plot line sounds amazing!!!! I can’t wait to read this when it’s out. Yes, I can be patient and wait until next year, but dude! Exciting!!! When are you coming to New Zealand again? *thud* You’re killing me, KILLING ME. Fall 2013 is one hell of a long ways away. But at least I get to spend the next year on my 5th read through the series and my best friend is joining me, her first go around! Finally I’ll have someone to talk about the books with! Oh my. Oh wow. Your facile imagination and wit and talent are amazing. These characters, these stories have been such a part of life these past decades … and now we get more, more, more! Thank you soooooo much. I have read all of your books at least three times and I will likely read them all again before MOBY is released for publication in the fall of 2013. I can hardly wait to re-read them all again and again. It never gets old for me and every time I read them, the characters become more like family, wishful thinking. Jamie and Claire are very real characters who live in a unsettled wild country in reality similar to today…hahah I’m thinking the corporate jungle here..
I’m proud of the people who settled the new world and I can imagine the hardships they faced. It’s amazing how our ancestors faced the chalenges of that era. They accomplished so much with so little. I am sometimes ashamed that we take our lives for granted nowadays. I love the fact that they live and love in the wilds of early North Carolina hisotry. The love of my life (not Jamie, but a red head just the same) lives there, I sometimes think they could be related… chuckling to myself here). Living in western Canada, I appreciate the historical descriptions throught all the books and enjoy the thought of love eternal, thank you for sharing their lives with us. E-reader (I love it). I am anxiously waiting for MOBY. I love your writings Diana as you have provided me with many thought provoking hours of entertainment. Wait a minute.. what’s Jamie doing coming back from the dead? Everyone was alive at the end of book 7. Did I miss something? Slight provision of backstory, there; Jamie did come back from the dead at the very end of ECHO. That fact has significant repercussions in the new book, though, so folk need to know about it. Ok – I really need to re-read Echo in the Bone because I do not remember anything about Claire remarrying. I do rememeber her and John together…was marriage only implied and I missed it? Please, please Diana no more new Sir John books pushing their way to the front of your busy schedule! We’ve been on this cliff hangar too long! Can’t wait for MOBY and am so worried about little Jemmy! Those who have not read Echo in Bone need to before they freak out more about Clair and John. What a cliff hanger! 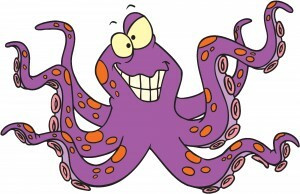 I hope the publishers use your purple Octipus I LOVE IT, i lol my hubby gave me a strange look but didnt ask why. Well, aside from other considerations, Mr. Purple there is slightly defective for my octo-purposes, in that he has only six legs. He’s just meant to provide visual interest; he’s not really up for the job of cover model. There are a lot of pretty octopuses in the world, though. I can’t post the picture, because it’s under copyright, but if you Google “blue-ringed octopus image,” you’ll see a gorgeous example. LOL! I just figured that two of the legs were hidden in the back. Now my grey coggs are working overtime and I’m sitting wearing out my wee brain trying to figure out how a current-day George Bain would have created an octopuss-delight for you in celtic artwork?????? PS: It was lovely to meet you In Strathpfeffer when you were over for ‘Echo’ signing – my friends were very pleased with their copies. I came to this Blog from a link on Barnes & Noble, after downloading Book 7, An Echo in the Bone. So, having not yet read, ” AEITB, perhaps a bit of SPOILER ALERT would help at the top of this Blog page for others who follow the link? [slight roll of eyes] 1) ECHO has been out since 2009, which really seems like sufficient time that it shouldn’t be considered a “new” book in need of spoiler alerts. And 2) the blog post starts right out by explaining that I was requested to write catalog copy for the _eighth_ book, and did. The blank space after that statement should probably have been enough time for you to stop reading, don’t you think? As in, 3) “catalog copy” is by definition a brief summary/come-on for a new book. It customarily tells you who, where, when, and–to a very small degree–what, but is no more a spoiler for the book than a movie trailer is for a movie. I understand now. I’m 61, never Blogged or sent a “Fan ” email ever before this, ” straight-from-the-heart” reaction! Those of us just introduced to your books are so lucky to be able to read themnone-after-the-other. WE are the Spoiled ones! Thank you, and i’ll be filling the next year with the Lord John and other companion books while I wait.